An easy peasy recipe that’s great as a canapé for a cocktail party to serve with a glass of bubbly. 1. Preheat the oven to 190°C/gas mark 5. 2. Cut the baguettes into 24 thin slices in total. Brush the bread with a little oil and place on a baking tray. Toast in the oven for 10 to 12 minutes, until crisp. Allow to cool. 3. Flake the crab meat into a bowl, then pick through it to make sure there are no stray pieces of shell. 4. In a separate bowl, mix the mayonnaise with the chilli, Tabasco and cayenne pepper. Season with a pinch of salt, then fold in the crab. 5. 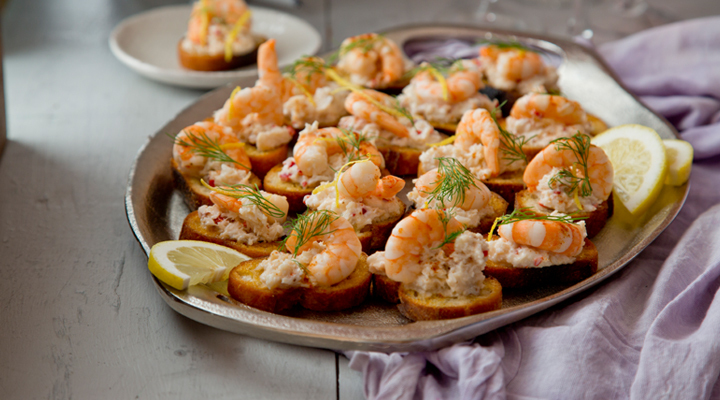 Divide the crab meat between the toasts and top each one with a cooked prawn. Drizzle with a little sweet chilli sauce and garnish with a sprinkle of lemon zest.